How to make puff pastry from scratch in just 15 minutes. If there’s one way I try to simplify my life, it’s by running less errands. For me, that means making things at home instead of heading to the store for a quick-fix. 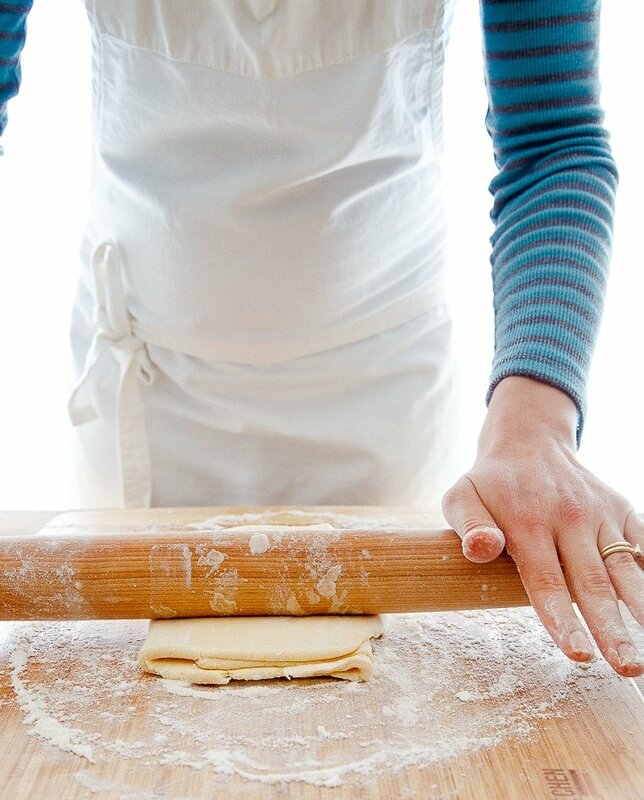 Have you ever wanted to learn how to make puff pastry instead of buying it at the store? Today is your day! If any of those recipes sound absolutely mouth-watering to you, but you’re lacking a sheet of puff pastry in your freezer, I’m here to help. This recipe makes one sheet of perfect puff pastry for you to use in any recipe you like! Add 1 cup of flour (125 grams) and 1/4 teaspoon of fine sea salt to your bowl. Stir gently. Add the 10 tablespoons (5 ounces) of COLD butter chopped into pieces, and then begin to work the butter into the flour mixture using a pastry blender, two forks, or your fingertips. If you’re using your fingertips, pinch the butter and smear it through the flour lightly. 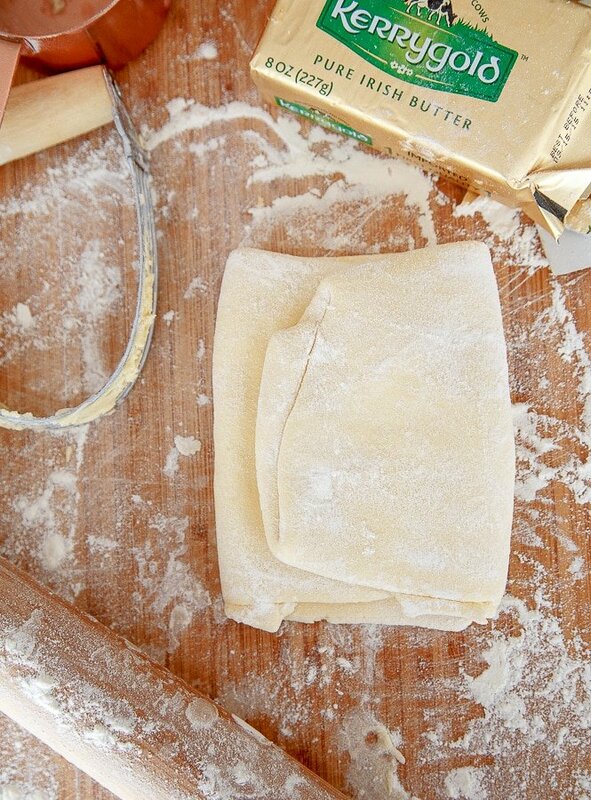 The fastest way to incorporate butter for homemade puff pastry is by using your fingers. When it’s fully incorporated, pour in 1/3 cup of cold ice water (don’t let the ice cubes fall in)! Gather your mixture into a rough ball and press it into a square shape on a well-floured cutting board or other work surface. Use plenty of flour to avoid sticking, but also be mindful about adding too much flour to your dough. Now we start rolling! I use a French rolling pin for this <—link to the exact one I use. 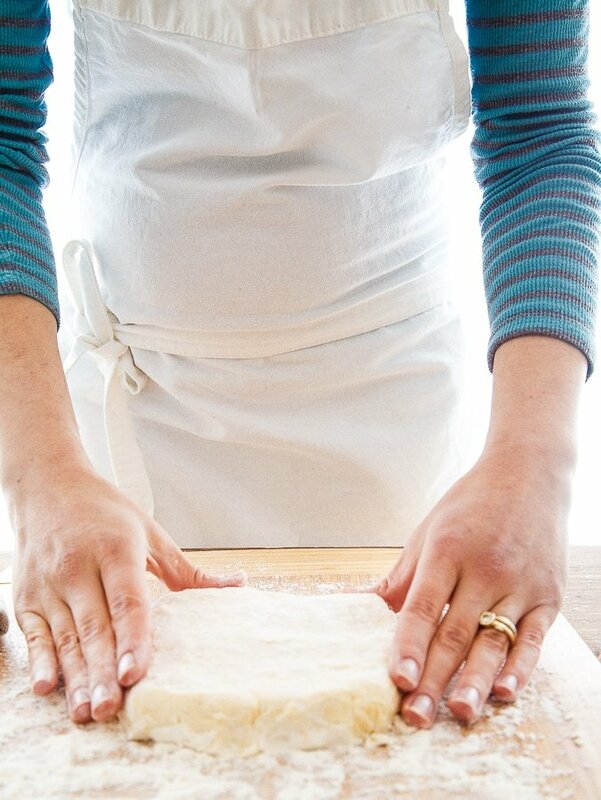 Since your dough is in a rough square shape, begin by rolling it away from you into a long rectangle shape. Then, fold it up like a letter: fold the bottom third up to the middle and then the top third over the middle. Give the dough a quarter turn and repeat. So, you roll out the dough, fold it like a letter, and turn at least 5 times. You’ll notice the dough becomes easier and easier to work with. This is how you know you’re doing it right! You made it! You successfully made homemade puff pastry from scratch! Now, wrap your dough baby in plastic wrap and stash it in the fridge. Or, the freezer, but remember to follow my rules for defrosting below. If anyone else needs to know how to make puff pastry from scratch, please, send them my way. We can be butter besties! Which kind of butter should I use for this easy puff pastry recipe? I tend to use unsalted butter for my baking needs. This way, I can add salt to my taste. I will always give you an exact amount of salt to use, but feel free to add more if you’re making a savory recipe, or less if you’re making a sweet recipe. What’s the best way to make puff pastry? Honestly, the best way to make it is to do it the day before and let it rest in the fridge. This way, you still get the convenience factor of grabbing a sheet from the fridge and baking! You can also make this recipe and stash it in the freezer. If you wish to freeze it, fold it length-wise along the longest edge so that it mimics the puff pastry you buy in the store. Then, defrost it overnight in the fridge, and let it rest on the counter for 15 minutes before attempting to use it. Does the quality of butter matter for making rough puff pastry? Can I double this recipe for quick puff pastry? Yes, absolutely! I would love for you to stock your freezer and fridge with this homemade puff pastry from scratch. I will caution you to stop at doubling it, don’t triple it. When you double it, be sure to divide it in half before you begin your rolling sessions. I’m so glad that I could teach you how to make easy puff pastry from scratch! Enjoy! How to make puff pastry from scratch in just 15 minutes! In a medium bowl, add the flour and salt. Stir to mix. Next, cube the butter and then add it to the flour bowl. 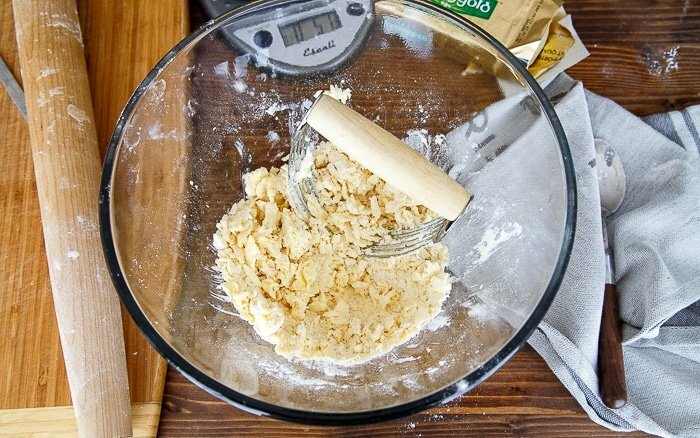 Using a pastry blender or two knives, cut the butter into the dough. It will be very crumbly, and you're done when the butter is in uniform pieces all about the size of peas. Flour the rolling pin, and roll the dough out in front of you into a rectangle about 10" long. No need to be too precise here. Roll out with flour for desired puff pastry use. Another recipe you might love: small batch chocolate chip cookies! I so agree eith you about the butter. I use European butter, in a black box, it has 12% fat,and it makes a difference when making brioche bread. I can’t wait to try this recipe. Hey Christina, greetings from India. I have been making this puffs pastry for a long time now. Must say its a foolproof recipe. Thanks for making my life easier with such awesome recipes. I love this recipe so much! It makes the perfect amount to make yummy fruit pastries in the morning for my husband, our little, and me. I also have used it for a pot pie, and one of my friends said she even made a pizza with it! I’ve yet to try that, but it sounds very fancy. I actually like this kind better than store bought, haha! have never stepped up into that next level of scratch puff pastry, have only used packaged, I prefer scratch generally, even if it’s a pain and this looks very straightforward with the right tips, like letting it rest overnight, so thank you for that tip and for this recipe! This is an awesome pastry. I use it for my orange cream puffs and Christmas pie recipes. Orange cream is easy and quite a treat for desserts after Asian dinners or stuffed pork loin meals.